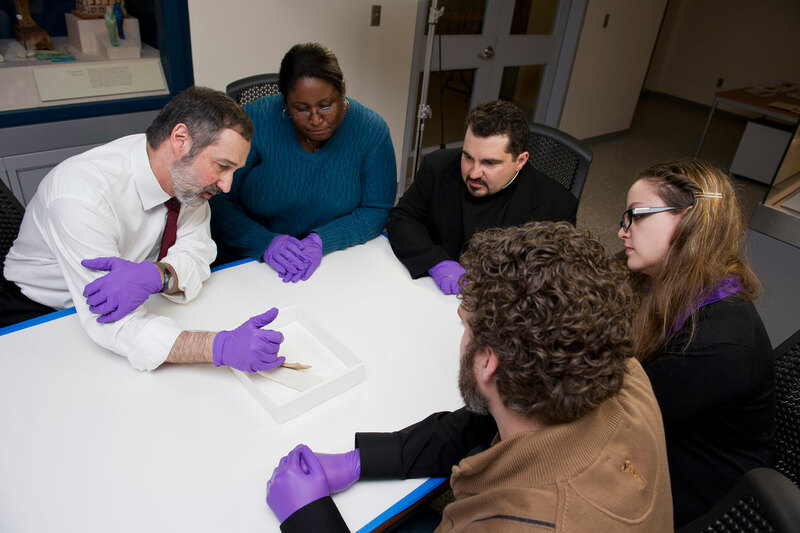 When the Johns Hopkins Archeological Museum was in its final stages of preparation prior to its reopening in the fall of 2010, an ancient inscription written on a piece of broken pottery presented a dilemma for Curator/Conservator Sanchita Balachandran. 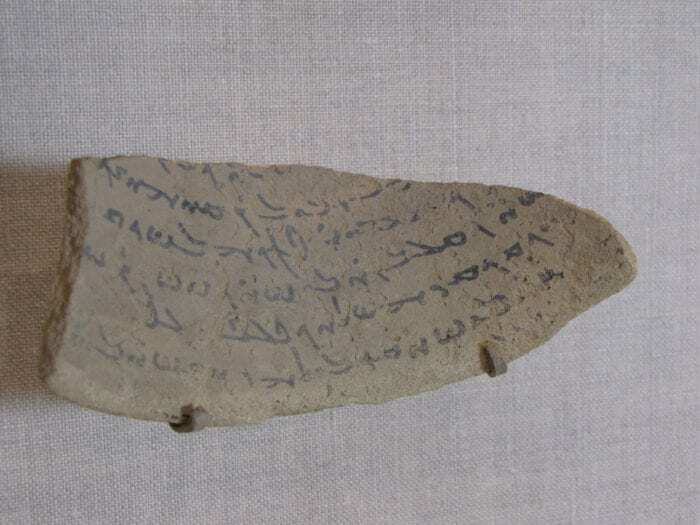 Dated and cryptic file notes accompanying the potsherd were meager, noting only that it was thought to be a part of an Aramaic incantation bowl. Such bowls containing magic spells are well attested in the Middle East of Late Antiquity (~400-700 AD). Herein was the first dilemma: If the potsherd was indeed an incantation bowl (file notes are not always accurate), how does one determine its orientation for mounting in a display case? Incantation bowls of this variety are notorious for being written in circular fashion with the writing wrapping around the bowl usually (but not always) from its rim to its center. [Cf. 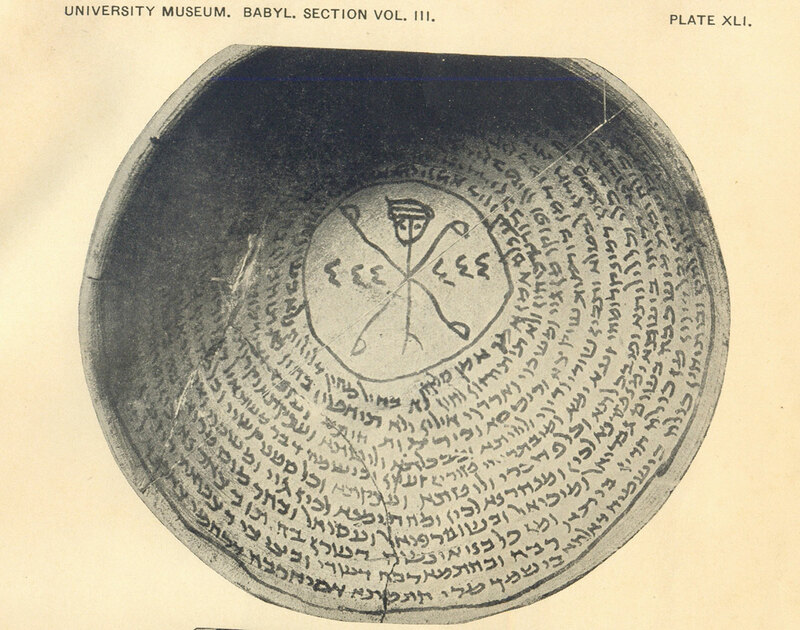 the Aramaic incantation bowl pictured here courtesy of Wikimedia commons.] Thus, mounted sideways, writing from what could be thought of as the top of the bowl would actually appear upside down as a result of the wrapping nature of the writing. The last thing one would want for a grand reopening of the Archaeological Museum would be to mount an inscription on a wall upside down! The task of determining the orientation of such an inscription is made even more difficult if one is not a specialist in Aramaic—that is, again, if the file notes were correct that this was indeed the language in question. (In this case, the file notes turned out to be incorrect!—or, more exactly, somewhat incorrect.) Unlike the Roman or Greek inscriptions also on display in the Archaeological Museum, the Semitic script used here is not identifiable to most museum visitors, even those with knowledge of Hebrew or Arabic. Some museum goers may even be surprised to know that the direction of the writing is from right to left, unlike English’s left to right. Add in a partial piece of a circular, winding inscription and, well, you get the idea. As important as orientation was the dilemma of meaning. An ancient inscription hanging on display occasions obvious questions of inquisitive museum visitors (and the reopening of the museum would bring them in record numbers): What does it say? When does it date? What window into the lives of our ancestors do we now possess thanks to the material culture they left behind for archaeologists to discover? What was the literary genre: a treasure map, love letter, royal decree, military campaign, mystic poetry, ration list—or indeed, a magic spell? Balachandran contacted Theodore Lewis, the Blum-Iwry Professor in the Department of Near Eastern Studies and one of two professors who teach Aramaic at Hopkins. (Not every university has Aramaists on their academic staff who can decipher such texts.) 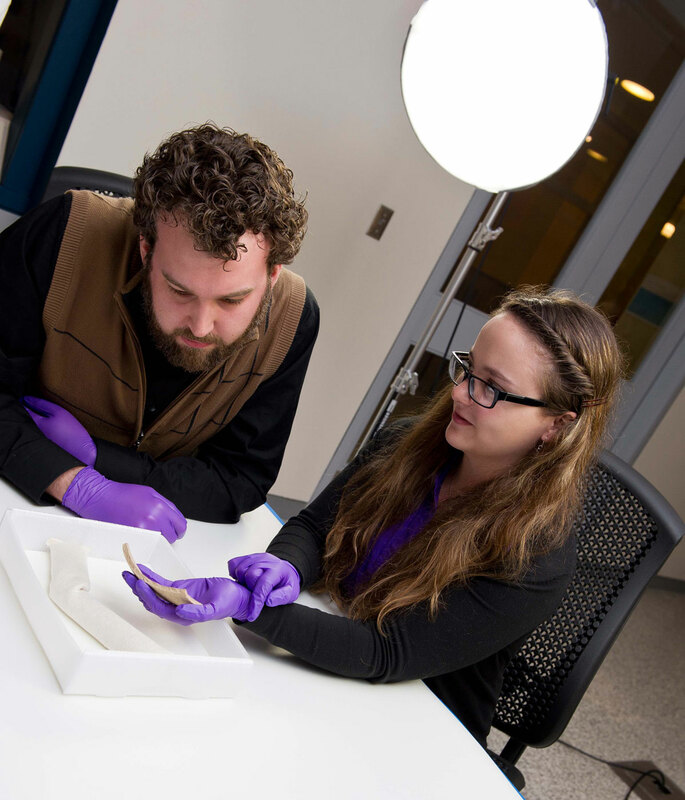 The timing was perfect on two accounts: First, Lewis was able to decipher the text (and the proper orientation) in time for the museum’s reopening. Yet more excitingly, Lewis just happened to be teaching a graduate seminar in Advanced Aramaic in the fall semester that was just about to start. Thus it was that the members of this class began a research project where they would, for the first time in their careers, decipher and translate an unpublished inscription for which there were no cribs. [Pictured right to left to right: Ted Lewis, Jaime Waters, Michael Simone, Erin Guinn-Villreal, T.J. Thames.] They would have to start from scratch without any guides to help them and without any certainty that the museum’s file notes were accurate with regard to the language or genre of the inscription. At the start, even the basics of decipherment of an unknown script can prove challenging. Were they holding the inscription right-side up or upside-down? Where would they look to identify what (to them at the time) was an unknown script, especially when the standard scholarly treatments of Aramaic script typology came up empty? Was the script indeed then Aramaic? What hints could be gleaned from analyzing the artifact itself? How was it made? What type of scribal hand was employed? Were there any indicators of date or literary genre? In the end, and as a testament to their inquisitiveness, research skills, training in epigraphy and knowledge of Semitic languages, these graduate students were remarkably successful. Some of the initial queries were solved in short order. Even prior to identifying the script fully, the orientation of the potsherd was determined by the stance and shape of certain letter-forms. Thames and Guinn-Villareal, [pictured at the left] working independently, identified the script by studying known incantation bowls from the Mesopotamian city of Nippur (ancient Iraq). Suddenly the initial decipherment of the inscription fell into place and with further analysis also its basic contents. In the end, the language turned out not to be the Aramaic one most readily thinks of (e.g. the Imperial Aramaic associated with the Persian Empire or the Aramaic known from the biblical books of Daniel and Ezra) but rather a well-known eastern dialect of Aramaic known as Syriac. Yet even here, the script was not the well-known Syriac scripts (Estrangela, Nestorian, Jacobite) but rather a pre-Manichean cursive script from approximately the 5-7th ct. A.D.
Guinn-Villareal, produced a tentative script chart for the Hopkins inscription (shown at the right) based on similar scripts published by James A. Montgomery’s 1913 study of Aramaic Incantation Texts from Nippur. 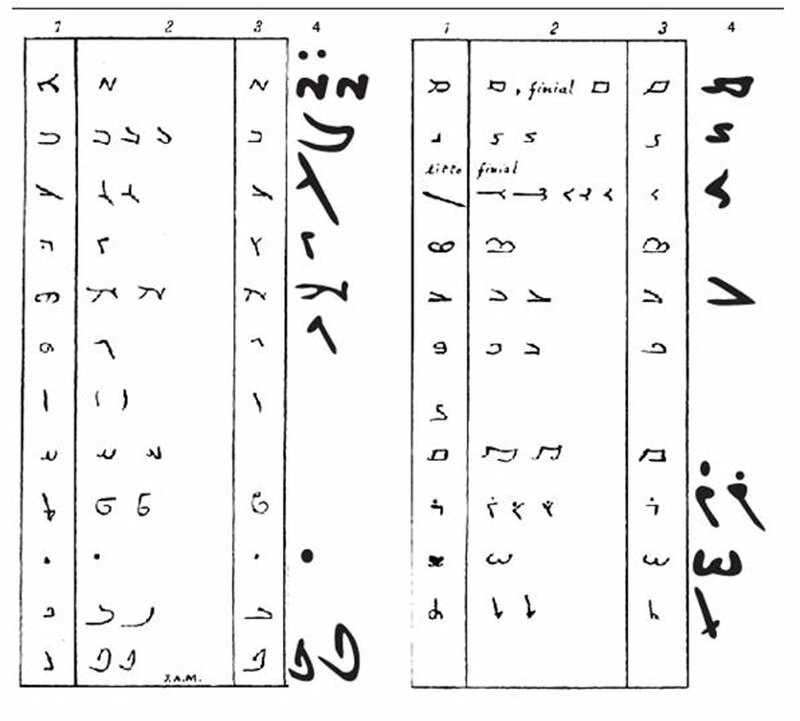 Thames added another script chart from a Syriac incantation bowl from the British Museum (shown below, at the left) that unlocked one intransigent letter in particular. 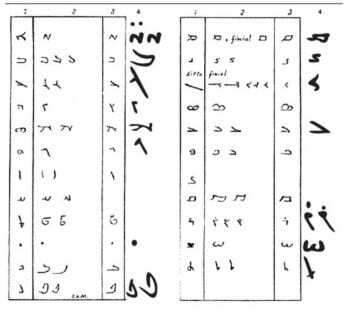 An additional puzzle was the presence of two dots that appeared over certain words (see scripts below) known as seyame that proved to be an ancient diacritical device marking plurality on nouns and adjectives. Ultimately, and only at the very end of their analyses after they had deciphered the text on their own, the class came upon a Syriac incantation bowl published by two scholars from the Hebrew University in Jerusalem (Joseph Naveh and Shaul Shaked) that had a nearly identical script. The shape of the potsherd and the contents of its inscription revealed without a doubt that it was indeed a part of an incantation bowl. The first broken line in the text mentions a mother (Mehanosh) and her son (Babi) yet with no further identifying markers or clues to interpretation. The “ureka” moment of decipherment was to be found from three fragmentary words further ahead in the inscription.
. . . ]šʾ wmʿbdʾ byšʾ w[m]šdr š[ . .
. . . and the evil spells and the one who sends . . .
A second line presented further evidence that we were indeed dealing with an ancient magic spell aimed at warding off of evil spells from a person’s house.
. . . biyšayyāʾ min bêtēh wa[ʾănā]šayyāʾ bêt[ēh] . . .
. . .the evils from his house and the [peo]ple of [his] house . . .